Alternate Names: "World Championship Poker DS"
World Championship Poker: Deluxe Series puts the best of Las Vegas, Atlantic City and the "Big Easy" right in the palm of your hand! Work your way down Casino Lane in a quest to bluff your way to riches. Enjoy realistic poker action against a wide variety of tough opponents, each with a unique set of "tells" to challenge you. Down on your luck? Try playing video poker or blackjack to rebuild your stake to buy another seat in the World Championship Poker tournament. 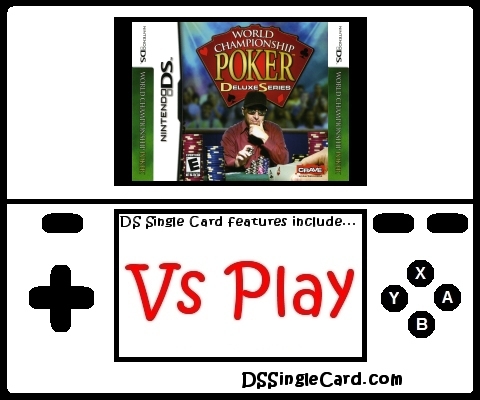 Click here to return to the DSSingleCard.com main page.